Posted March 10th, 2006 by Ms. Jen & filed under sxsw. Breakfast will all of the gang – Brit Pack, the Belgian/Dutch Pack, Shaun and Lesile, and others. It was good to sit and hang out in the sunny breakfast area. It was good to chat, drink caffiene, and laugh. Jorie Lordes dropped Lauren (LEI) off around 11am and joined us upstairs for awhile. At noon, a group of us (LEI, Lesile, Jessica Spengler, Chris Mills, Craig, et al) walked over to the Whole Foods mothership for lunch and to do a little shopping at Whole Foods and Waterloo records. We sat outside near the Whole Foods “water feature” stream to eat our lunch in the sun. Warm. LEI, Lesile and I went back in to buy cheese, wine and crudites for our proposed wine and cheese party. Afterwards we walked over to Waterloo with Aaron Gustafson and I bought a new tshirt (bunny with headphones) and a new pink bowling bag purse. The best part is that Aaron gave us a ride home in his rented AC car. Yes, it is hot enough to need Air Conditioning. Yeah! 5pm – Saw the a gang of the Hampton folk (BP, BDP, etc) go to the free drinks in Brush park, sit under a big oak in the sun, and then walk around 6th Street and 4th Street looking for a place to have a drink before dinner with the Aussies and then Break Bread with Brad. We found Anders Pearson and he led us to 219 West 4th St. This was a nice wine bar/hang out place. We ended up staying and turning it into the Dinner with the Aussies. I had several delightful glasses of wine, ceviche and calamari, as well as delightful conversations with Lesile, Jessica, Gillian (Jill) Carson, Erris Free, Andy Budd, and others. I was finally able to pass off the loaf of bread that I had been carrying around since Whole Foods off to Molly Holzschag. Someone brought label stickers and we made “tags” for people. Andy Clarke gave me “I met Chuck Heston once”, and one other that I forget what it said. 9pm – We went as a herd across to Break Bread with Brad at the Gingerman. As I was walking out of 219 West, I saw The Wolf!!!! The Wolf, aka John Marlow, is an old online friend from the 1996-2001 message board days. I had lost his cell # and new email, and didn’t know how to find him. 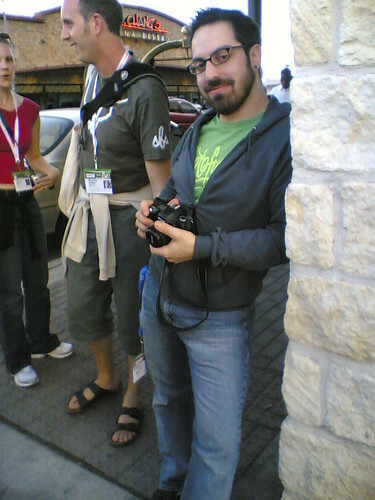 John has lived in Austin since 1999 and is always a good SXSW host. He and I may try to get together for drinks at some point. There was quite a line to get into the Gingerman and I ended up having big hugs and chats with all kinds of folk coming in and going out (Molly Steenson, Sergio Villareal, Tom Coates, Heather Heskith, etc). Once we got into the venue, I was very tired and not much up to chatting. Brad was very welcoming. I got a bunch of the “My URL is…” stickers and started to write up name tags for folk. When I hit the tired wall, I went back to the hotel with a group of folk and off to bed I went. Kenneth Himschoot was kind enough to walk the ladies back. This was truly the first day of SXSW, even if the conference does not start until tomorrow. 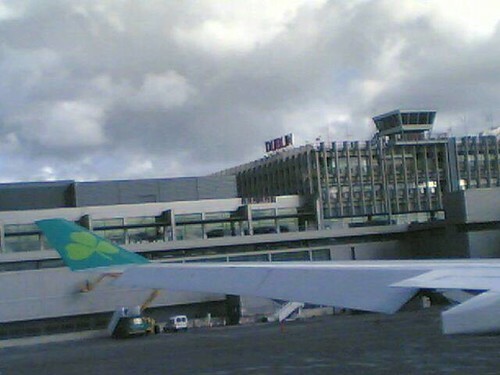 Fri 03.10.05 – @ Check in. SXSW – Let the games begin! 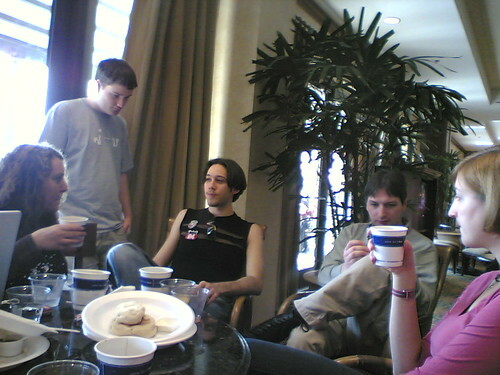 Fri 03.10.05 – Breakfast at the hotel. Posted March 9th, 2006 by Ms. Jen & filed under sxsw. I left my apartment at 10am to go to the Dublin Airport. At the airport, I went to the Aer Lingus counter to see if I could extend my ticket two days to stay in AUstin a bit longer than just SXSW Interactive. Nearly 3/4 an hour later, I had a ticket to return on 3/17 for only $81 more. On the flight from Dublin to Chicago O’Hare, I worked on my thesis and worked up interview questions, as well as distilling what my 171 survey respondents said to my hypothesis and interview questions for more in depth questions. Last two hours of the flight was very turbulent, and I got very air sick. It took another two hours at Chicago walking up and down the concourses to stop the intense nausea. Due to the large rain storm, there were two hour delays for all flights and many were cancelled so the airport was full of crying kids and agitated business people. The 6:35pm flight to Austin finally departed after 8:30pm and we did not arrive in Austin until after 11pm. I got to the Hampton late and then woke up after 5 hours. Argh. Travel over 24 hours, sleep less than 5. The best part of the flight to Austin was that I sat next to a fellow who works as an engineer for a large construction company and he worked on the Hampton Inn build out. He said it is very safe. Good to know. 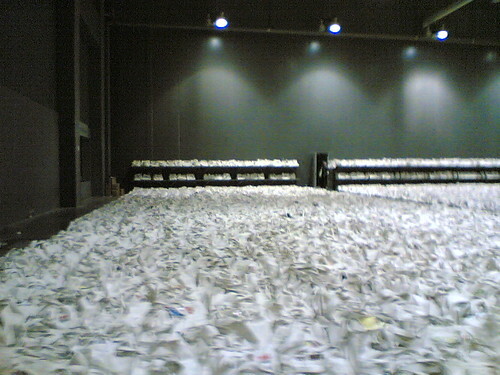 Posted March 9th, 2006 by Ms. Jen & filed under photos + text from the road. 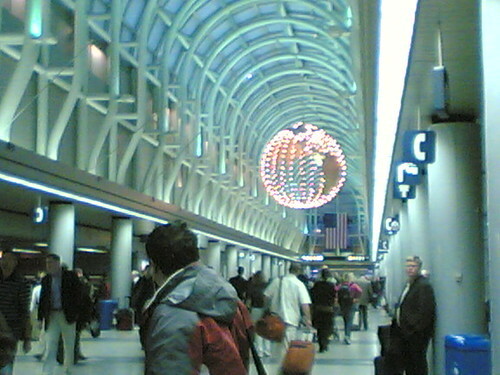 Thur 03.09.06 – Now at O’Hare attempting to walk off turbulence induced nausea, good thing the flight to Austin is late. Bye DUB, AUS here I come! The cabin doors are closed & the plane is backing up. Off we go, off goes the Nokia.